Bears and chipmunks are smarter than they look. They stuff themselves all summer and sleep all winter. Talk about the good life. But I guess in fairness, we have to compare our lot with the less fortunate critters out there as well. Every time I see a raven or a whiskey jack when it's -40 I wonder how on earth they keep from freezing their wiry little legs off. Come to think of it, I did see a one-legged raven a few years back . . .
Upsala gained an eensy, weensy, tiny, molecular spot in Olympic history today. 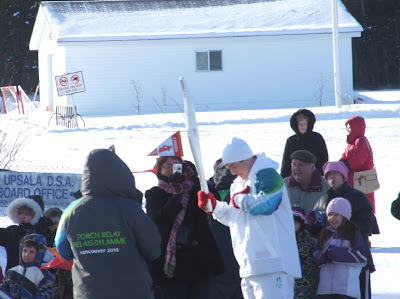 The Olympic Torch visited our fair hamlet on it's way to Vancouver. 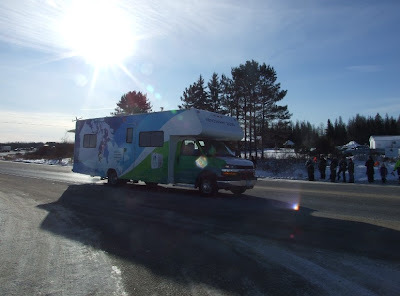 Here is the Olympic van. 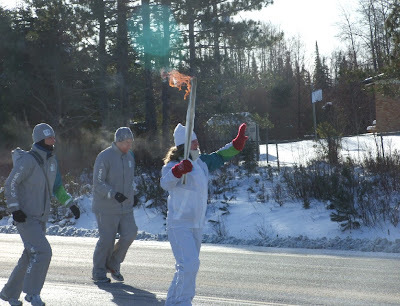 And here is the Torch runner. If she looks cold, it's because it's -25 C (about -13 F). Here's the guy freezing his buns off waiting for the relay to arrive. 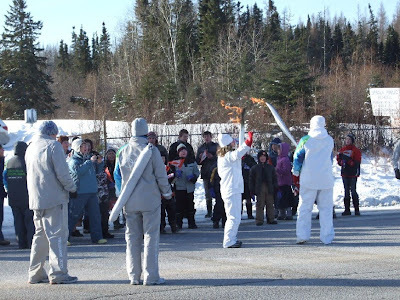 Here are the school kids and villagers cheering the runners on with a frozen rendition of "Oh Canada," (while the bears and chipmunks slumber cozily in their dens). Very patriotic, very Canadian, and numbingly cold (did I say the bears were smart, or we're stupid?). 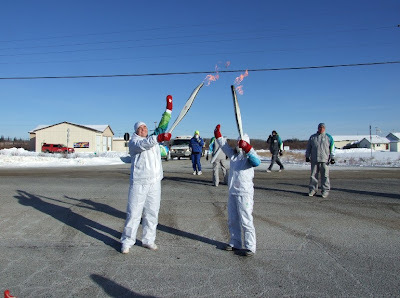 And here are the distinguished torch bearers, pausing to absorb this profound moment in Upsala history. If those shadows seem long for 12:00 noon, it's because we are on the edge of Central Time Zone, so by the sun's time it's only 11:00. You can see the fire hall on the left, solemnly observing the gala affair. I may be making a big deal of this, but it isn't every day that Upsala gets included in an Olympic-sized event. We've never been one of the top ten gotta-see spots in Canada, surprisingly enough. Or the top fifty or the top thousand or the top million. People drive through Upsala, not to it, and they're usually going somewhere else far away. So it was nice of these folks to stop and say hi. You may remember my Spur-of-the-Moment Potato Soup (September 26 post). I've added a few innovations that may or may not have improved it. For the record, here is the original "recipe" (I use the word in a generalized sense . . . I don't really know how to cook properly). The additional innovations are listed after. cook on low for a while, stirring often unless you like burned potato soup. It should thicken up a little. Add a touch of curry powder. My kids say this is one of their favourites now . . . especially Erinn's muffins. No, I'm not giving you the recipe for those . . . they probably can't be reproduced by anyone else. As a consolation prize, here is a link to a cornmeal muffin recipe I've never tried. If that recipe turns out to be lousy, and someone really wants to try Erinn's, here's the deal: post a comment asking me for the recipe and I'll dig it out and include it in my next blog entry. Otherwise, you're on your own. Or you can try my Parmesan Garlic Basil Oregano Pepper Bread Sticks (September 30 post). Side note: the bears and chipmunks don't get to eat potato soup and muffins (unless you feed them, which you should never do), so maybe their 'good life' isn't so good after all.